When I first began studying economics, the conventional wisdom was that “factor shares”—the shares of national income paid to labor and capital—were relatively constant. So, there really was no need to worry about the problem of inequality. Poverty, maybe, but not the gap between wages and profits. Now, of course, all of that has changed. 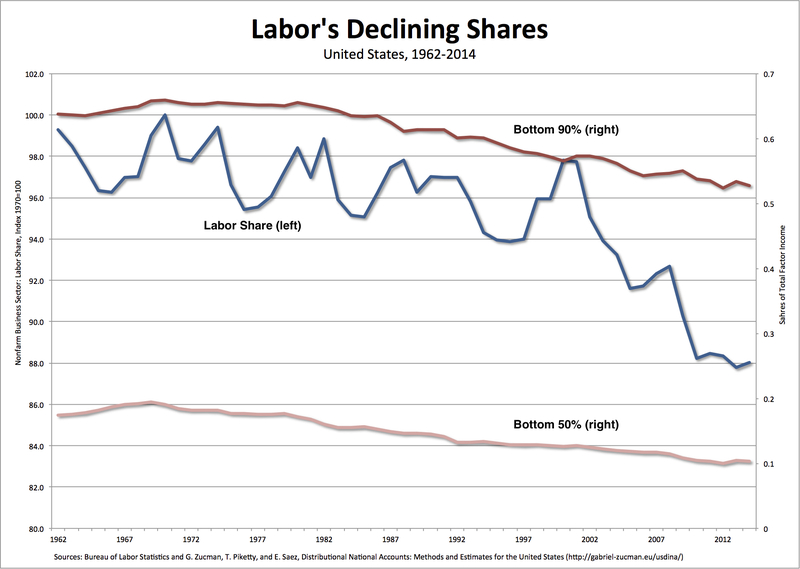 Not only is there increasing recognition that the labor share changed, it’s been declining for more than four decades. For at least the past 15 years, and possibly for several decades, labor’s share of national income has been declining and capital’s share has been rising in most advanced and many emerging economies. Thus, for example, the labor share of national income in the United States has fallen by about 12 percent from 1970 to 2014 (as indicated by the index scale on the left side of the chart above). But, as it turns out, that’s only part of the story. The share of national income going to workers has declined by even more than that. the compensation of a highly paid CEO and a low-wage worker would both be included in the labor share. So, in order to get an accurate picture of workers’ share of national income, we need to turn to other data. What I’ve done in the chart above is measure (on the right side of the chart) the shares of income going to the bottom 90 percent and the bottom 50 percent of Americans. And, not surprisingly, the declines are even more dramatic: 20 percent for the bottom 90 percent (falling from 66 percent of total factor income in 1970 to 53 percent in 2014) and even more, 45.8 percent, for the bottom 50 percent (from 19 to 10.3 percent between 1970 and 2014). Those are the shares actual workers—not proprietors or CEOs—take home. Finally, the conventional wisdom has begun to change. Under existing economic institutions, factor shares do in fact change—and they’ve been turning against labor for decades now. The bottom line, though, is the situation of workers is even worse than what is indicated by the declining labor share. The workers’ share has fallen even more dramatically in recent decades. It’s time, then, for the old models—the old theoretical models as well as the models for organizing the economy—to be thrown out and replaced in order to create an economy that actually works for American workers. Back in 2010, Charles Ferguson, the director of Inside Job, exposed the failure of prominent mainstream economists who wrote about and spoke on matters of economic policy to disclose their conflicts of interest in the lead-up to the crash of 2007-08. Reuters followed up by publishing a special report on the lack of a clear standard of disclosure for economists and other academics who testified before the Senate Banking Committee and the House Financial Services Committee between late 2008 and early 2010, as lawmakers debated the biggest overhaul of financial regulation since the 1930s. Well, economists are still at it, leveraging their academic prestige with secret reports justifying corporate concentration. Right now, the United States is experiencing a wave of corporate mergers and acquisitions, leading to increasing levels of concentration, reminiscent of the first Gilded Age. And, according to ProPublica, a small number of hired guns from economics—who routinely move through the revolving door between government and corporate consulting—have written reports for and testified in favor of dozens of takeovers involving AT&T and many of the country’s other major corporations. Economists have long rejected the “antitrust by the numbers” approach. Indeed, the quiet consensus among antitrust economists in academia and within the two antitrust agencies is that mergers between competitors do not often lead to market power but do often generate significant benefits for consumers — lower prices and higher quality. 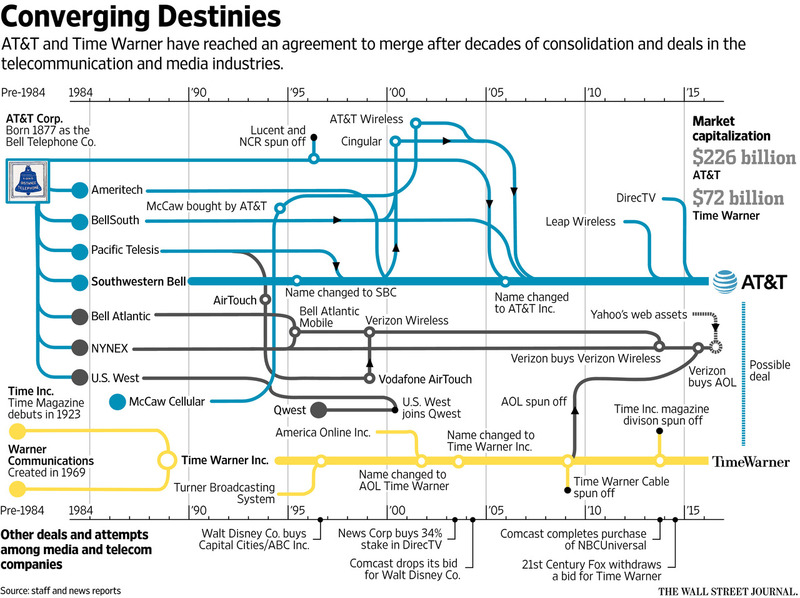 Sometimes mergers harm consumers, but those instances are relatively rare. Because the economic case for a drastic change in merger policy is so weak, the new critics argue more antitrust enforcement is good for political reasons. Big companies have more political power, they say, so more antitrust can reduce this power disparity. Big companies can pay lower wages, so we should allow fewer big firms to merge to protect the working man. And big firms make more money, so using antitrust to prevent firms from becoming big will reduce income inequality too. Whatever the merits of these various policy goals, antitrust is an exceptionally poor tool to use to achieve them. Instead of allowing consumers to decide companies’ fates, courts and regulators decided them based on squishy assessments of impossible things to measure, like accumulated political power. The result was that antitrust became a tool to prevent firms from engaging in behavior that benefited consumers in the marketplace. And, no doubt, there will be plenty of mainstream economists who will be willing, for large payouts, to present the models that justify a new wave of corporate mergers and acquisitions in the years ahead. I have argued many times over the years that mainstream economists, especially mainstream macroeconomists, largely ignore the issue of inequality. And when they do see it, they tend to misunderstand both its causes (often attributing it to exogenous events, such as globalization and technical change) and its consequences (often failing to connect it, other than through “political capture,” to events like the crash of 2007-08). In my view, mainstream economists overlook or forget about the role inequality plays, especially in macroeconomic events, for two major reasons. First, their theoretical and empirical models—either based on a representative agent or undifferentiated macroeconomic relationships (such as consumption and investment)—can be solved without ever conceptualizing or measuring inequality. The models they use create a theoretical blindspot. But, second, even when it’s clear they could include inequality as a significant factor, they don’t. They literally choose not to see inequality as a relevant issue in making sense of macroeconomic fluctuations. So, as I see it, when it comes to inequality, mainstream economics (especially, as I say, mainstream macroeconomics) is haunted by both a theoretical and an ethical problem. That’s why recent research by Kurt Mitman, Dirk Krueger, Fabrizio Perri is so interesting. What they show, using a standard macroeconomic model with household heterogeneity to account for an unequal wealth and consumption distribution, is that inequality does in fact matter. In particular, they demonstrate that the aggregate drop in expenditures depends on the distribution of wealth (e.g., it is much larger in an economy with many low-wealth consumers) and that the effects of a given macroeconomic shock are felt very differently in different segments of the wealth distribution (e.g., low-wealth households have little ability to insure themselves against risk, and thus the welfare impact of a recession is significantly larger for them). As a consequence, they make it abundantly clear that ignoring inequality means failing to understand the severity of a macroeconomic downturn and underestimating the welfare costs of a deep recession. That’s not all the work that needs to be done, of course. Mitman et al. rely on exogenous macroeconomic shocks rather than analyzing how inequality itself plays a role in creating the conditions for an economic downturn. But even their limited attempt to include inequality as a significant factor in an otherwise-mainstream macroeconomic model demonstrates that such work can in fact be done. In other words, it’s not that mainstream economists can’t make sense of inequality in their models. They simply, for the most part, choose not to. John Lennon (on the B side of “Imagine”) thought that life was hard, “really hard.” I can understand that. But is modeling inequality really all that hard? Paul Krugman seems to think so, at least when it comes to the size or personal distribution of income. That’s his excuse for why mainstream economists were late to the inequality party: they just didn’t know how to model it. And, according to Krugman, not even Marx can be of much help. Well, let’s see. It’s true, Marx focused on the factor distribution of income—wages, profits, and rent, to laborers, capitalists, and landowners—because his critique was directed at classical political economy. And the classical political economists—especially Smith and Ricardo—did, in fact, focus their attention on factor shares. That was Marx’s goal in the chapter on the Trinity Formula: to show that what the classicals thought were separate sources of income to the three factors of production all stemmed from value created by labor. Thus, for example, laborers received in the form of wages part of the value they created (“that portion of his labour appears which we call necessary labour”); the rest, the surplus-value, was divided among capitalists (“as dividends proportionate to the share of the social capital each holds”) and landed property (which “is confined to transferring a portion of the produced surplus-value from the pockets of capital to its own”). It is really just a short step to show that, in recent decades (from the mid-1970s onward), both that more surplus-value has been pumped out of the direct producers and that investment bankers, CEOs, and other members of the 1 percent have been able to capture a large share of that mass of surplus-value. That’s how we can connect changing factor (wage and profit) shares to the increasingly unequal individual distribution of income (including the rising percentage of income going to the top 1, .01, and .001 percents). See, that wasn’t so hard. . .